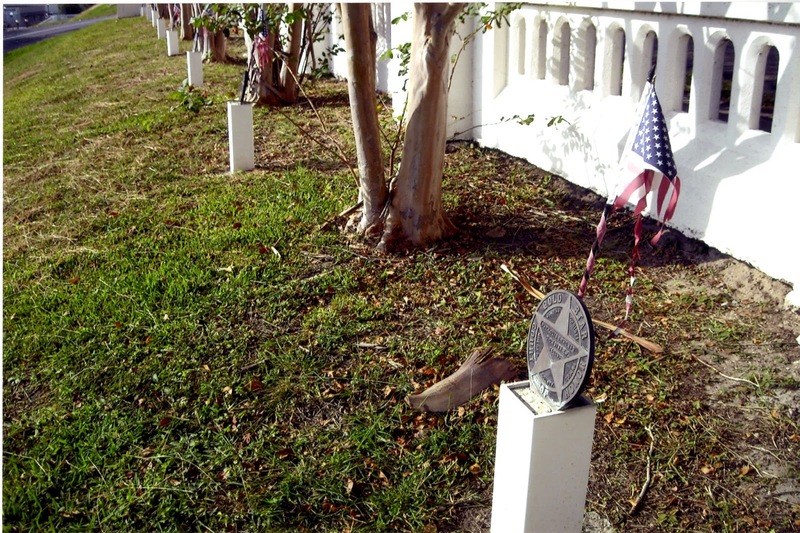 The original memorial consisted of bronze medallions for each serviceman with a crepe myrtle tree planted adjacent to it. 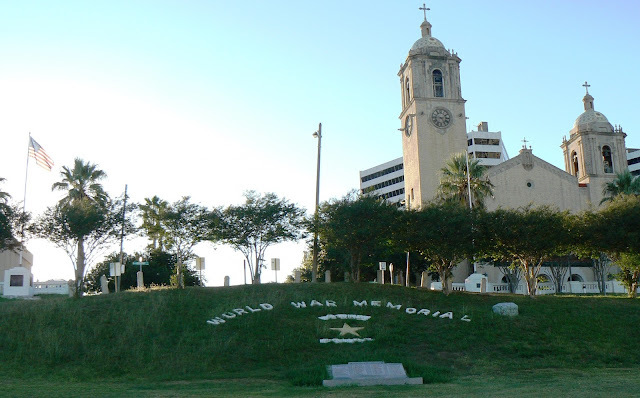 The medallions and trees line the Broadway Bluff Balustrade on either side of Lipan Street (which is just above the words "World War Memorial" in the photo below). About 2,500 people attended the original dedication in 1931. Back then, they had no idea there would be a second World War. Just to the right in the first photo, not visible in it, is the sign pictured just above. In the background, next to the balustrade, you can see one of the medallions on a small post. In a June 1932 photo, the sign can be seen on the base of what is now the flagpole in the upper left corner of the first photograph in this post, at the top of the bluff. In that 1932 photo, the sign was illuminated with incandescent bulbs; later, those bulbs were changed to neon. It appears that might have happened and the sign might have been moved around April 2000 as part of a restoration project, but it's not clear to me if the sign is lit today. 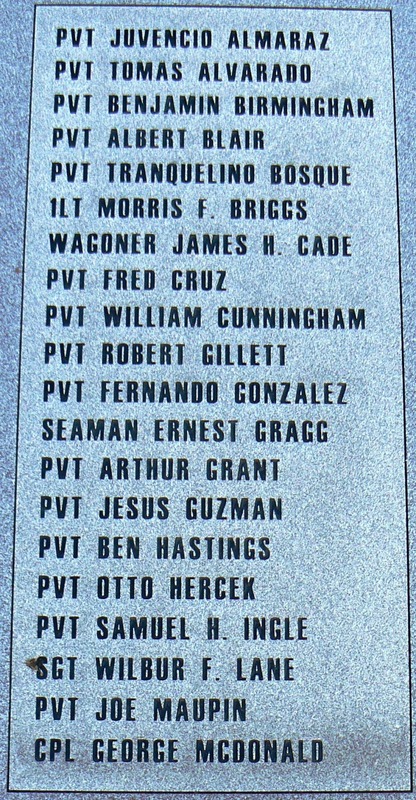 It is about level with the large granite monument pictured below, which was added in 2001. 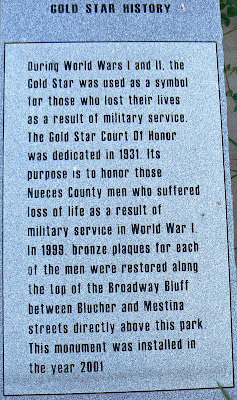 The concrete letters and star reading "World War Memorial Gold *star* Court" were added sometime between May 1941 and November 1944. Below: Medallion with tattered flag at Gold Star Court of Honor, Spohn Park, Upper Broadway and Lipan. October 2010. Kenneth L. Anthony Photographic Collection, Item 212-158. Special Collections and Archives, Mary and Jeff Bell Library, Texas A&M University-Corpus Christi. Used with permission of Kenneth L. Anthony. 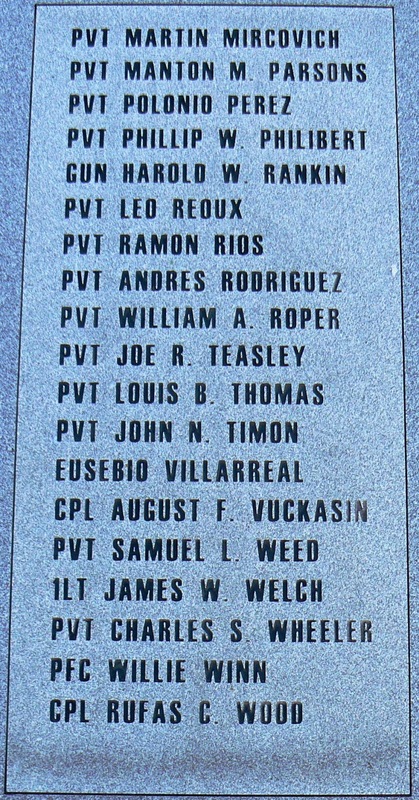 Above: Medallion memorializing Eusebio Villareal [note his name was spelled incorrectly on both monuments], Gold Star Court of Honor, Spohn Park, Upper Broadway and Lipan. October 2010. Kenneth L. Anthony Photographic Collection, Item 212-159. Special Collections and Archives, Mary and Jeff Bell Library, Texas A&M University-Corpus Christi. Used with permission of Kenneth L. Anthony. Below: Medallion memorializing Pvt. 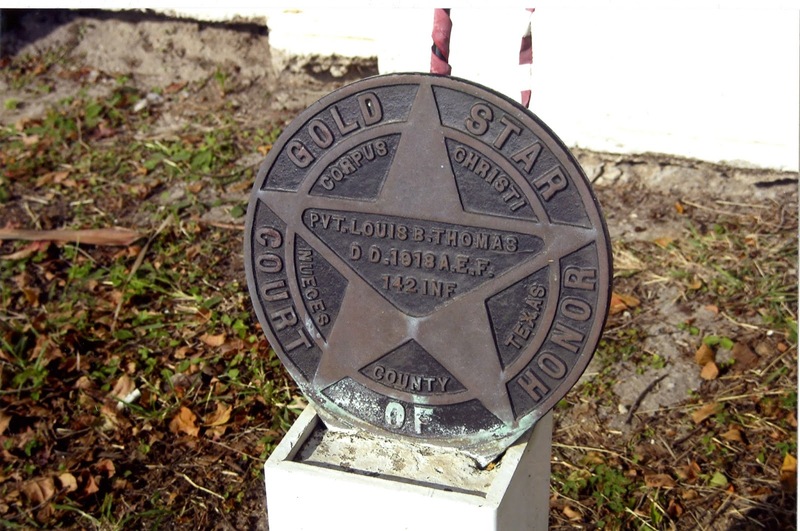 Louis B. Thomas [Tamez], Gold Star Court of Honor, Spohn Park, Upper Broadway and Lipan. October 2010. Kenneth L. Anthony Photographic Collection, Item 212-160. Special Collections and Archives, Mary and Jeff Bell Library, Texas A&M University-Corpus Christi. Used with permission of Kenneth L. Anthony. 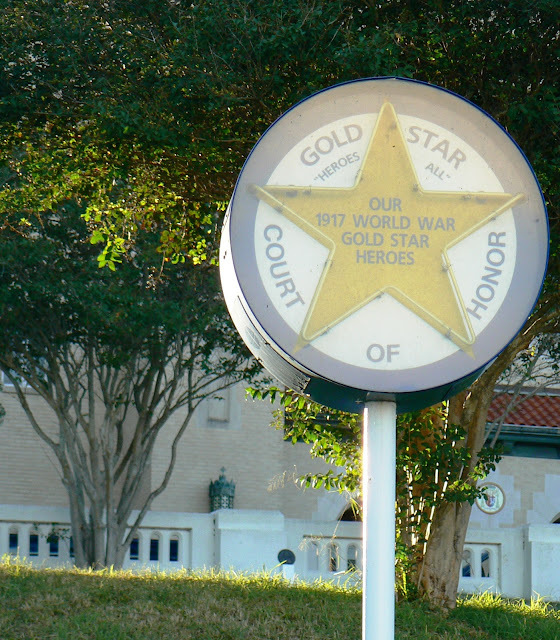 The Corpus Christi Gold Star Court of Honor pays tribute to the mothers of the servicemen of Nueces County killed during World War I (1914-1918). 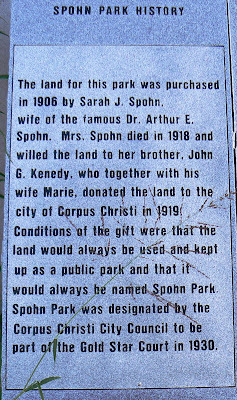 Incorporated into the existing Spohn Park, part of the Broadway Bluff improvements completed in 1916, this court was the first of its kind in the state when dedicated on March 22, 1931. The court was a project of the Daughters of the American Revolution (DAR), led by Mrs. Sam (Lillie) Rankin, regent of the Corpus Christi Chapter. The DAR was joined by the American Legion, as well as local civic, religious and business groups. The Gold Star Court was designed by Mrs. Frank [Eloise] de Garmo. Instrumental in establishing Courts of Honor in northeast cities, de Garmo envisioned the memorial as a living space to honor the fallen servicemen who made the ultimate sacrifice in the ‘War to End All Wars.’ The city planted crepe myrtle trees and built a gold star light, three feet in diameter, outlined with yellow and white lamps; in the center read the words, "Our 1917 World War Gold Star Heroes." 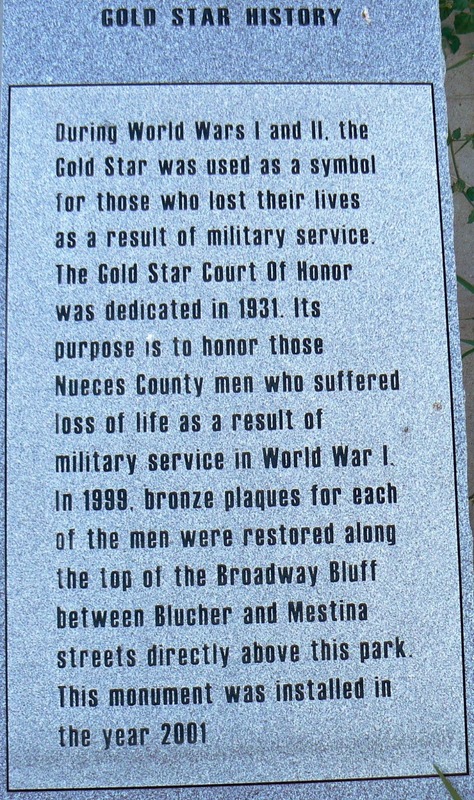 The gold star was located at the northern point of the highest terraces, and at the opposite end, Nueces County officials placed a magnificent flagpole. On August 2, 1932, a British 5-inch field piece and a 3-inch caisson and limber were added to the site [later removed]. Later, large concrete letters reading "World War Memorial Gold Star Court" were placed in a semicircle. 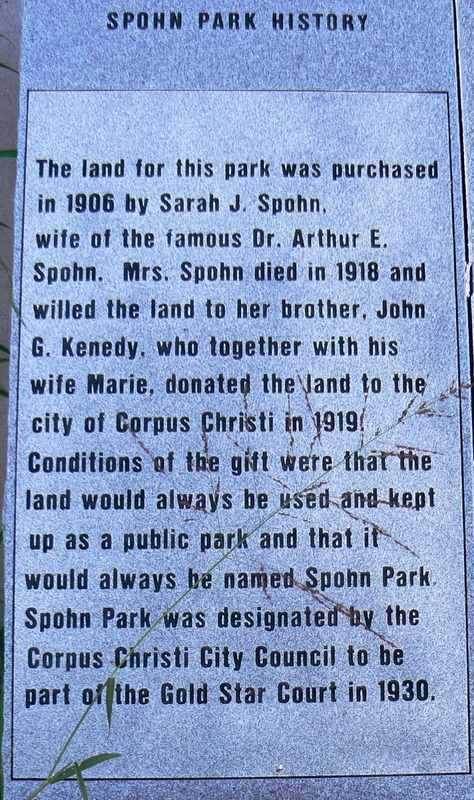 In 1988, Broadway Bluff, Spohn Park, and the Gold Star Court were listed in the National Register of Historic Places. The site fell into disrepair until volunteers undertook a restoration project in 2000. 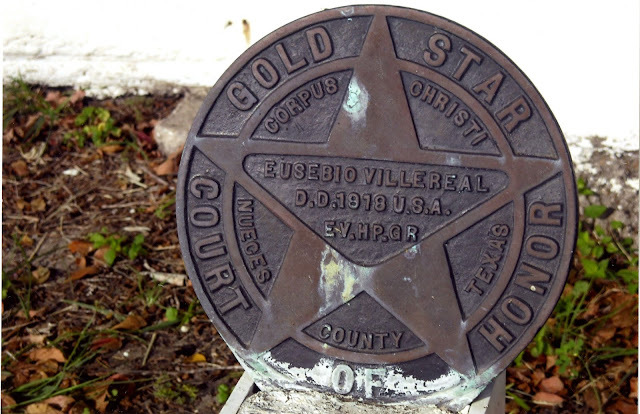 A private, city, and county effort, the Gold Star Court — the first in Texas — honors Nueces County’s revered heroes and their mothers. This post was done in honor of Memorial Day for The Honor Roll Project begun by Heather Wilkinson Rojo of Nutfield Genealogy.